We are listed at the top in the list of the staggering Conveyor Rollers Manufacturers in India. The Belt Conveyor Rollers offered by us are widely demanded in the market due to the unmatched quality and unsurpassable performance in respective applications. Moreover, customers are also eased with the availability of the Steel Conveyor Rollers loaded with all the advanced features. 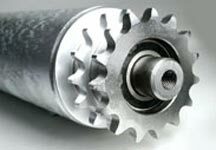 Precision bearings are standard in Bohra conveyor rollers. These bearings are suitable for any conveyor system speed, but are typically used when speeds exceed 400 rpm or when conveying heavy material handling loads across the conveyor system. These bearings have hardened and ground balls, raceways and retainers. They are available shielded or sealed. These are ABEC-1 bearings and come either grease packed or oiled. Semi-Precision bearings are typically used for higher speed conveyor system applications up to about 400 rpm. These bearings have hardened raceways and hardened steel balls with a retainer to separate the balls. Generally give longer life and are quieter than non-precision. Non-precision bearings are typically used for slow to moderate speed conveyor system applications. These bearings have stamped outer races, carbon steel balls and ground raceways. As a rule of thumb, they do not last as long and are noisier than precision and semi-precision bearings. These bearings are used for conveyor rollers that are going into a conveyor system in corrosive material handling environments. Machined raceways and series 300 stainless steel balls are good for light to moderate loads and can be used for high speed conveyor systems.